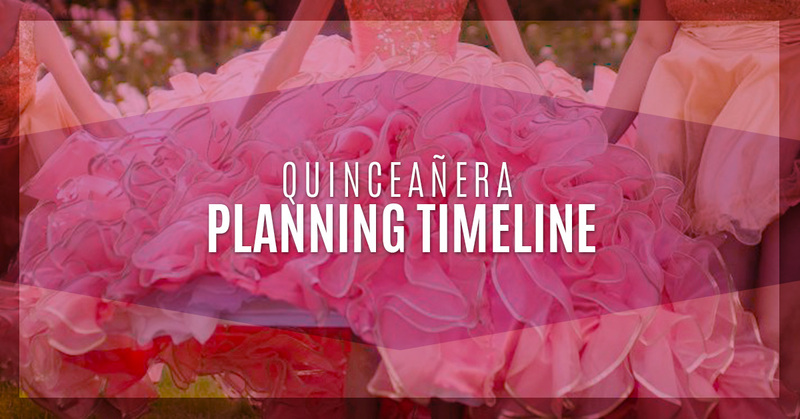 Planning for a quinceañera is arguably more stressful than planning for a wedding. While knowing the date of your own birthday at least eliminates the need to set a date for the party, it also means you have more time to stress about the details. You’ve been dreaming about this day since you were a little girl, all of your family and friends will gather to celebrate you, and you are celebrating your entrance into womanhood. Oh, did we mention you have to dance in high heels in front of everyone? No big deal, right? As the Top Rated Local® party venue in Katy, we have hosted hundreds of quinceañeras over the years. We wanted to offer this helpful event planning timeline so that you don’t get so overwhelmed in the process. There’s no better way to celebrate your 14th birthday than planning for your 15th, right? The one-year mark is important because it means you’re getting an early but reasonable start on party planning. The absolute most important thing you can do at this point is choose your party venue. Every other detail can fall into place, even with minimal planning, but you must reserve your party venue well in advance. Otherwise, all the good ones will be gone and you might be left hosting in your church’s dingy basement. Having a venue this early also means you can incorporate the venue’s space and appearance into your party planning. You’ll know how many people you can fit and what theme might work best with the party hall atmosphere. After a venue, the other time-sensitive component involves your guest list. You need to choose who will be on your court (if you’re having a court) and who you want to attend. This way, you can send out invitations and even save-the-dates early to ensure that as many people as possible can attend! At this point, you should also hire a caterer. Better yet, you could choose a venue that provides catering services so that you have one less thing to think about. Now, when it’s closer to the date, you can spend more time on your appearance. You’ve seen your party venue, so you can choose a dress that will work well with the surroundings. Don’t forget to schedule a makeup and hair trial as well once you choose your dress. There’s nothing worse than thinking you look like a clown on your special day if you haven’t tested your hair and makeup beforehand! If you’ve followed this timeline, you already have the big things figured out. You have your location, your dress, your venue, your food, and your guests. At this point, you could throw your quince tomorrow! In the weeks leading up to the event, write and practice your speech and dance. Remember to get excited about the event! There’s no need to stress. Instead, envision the day going perfectly. Are you looking for a party venue in Katy for your quine? Contact Alegria Gardens today!